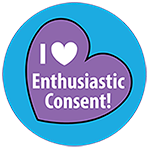 Enthusiastic Consent – It's about respect for yourself & others. Exciting news! In record time, we received our IRS designation letter that we are an approved 501(c)(3) non-profit with EIN #83-1241420. We are now listed on GuideStar, we can accept donations through Network for Good, and we’re an Amazon Smile eligible charity.